Traditional clambakes are an event - they take all day and require digging a sand pit, but this version is a lot less work and still YUMMY. Instead, choose a secluded spot in the backyard. This is a repost, and one of my favorite summer posts from 2009. Shellfish edged salad plate and dessert bowl from Homegoods. Kiwi green dinner plates from Oneida, cloth napkins from Homegoods. Napkin rings from Kohl's, and a starfish from the beach. Margarita glasses used for ginger iced tea from Pfaltzgraf. How about a tasty pitcher of Ginger Iced Tea. It's a perfect summer beverage. The idea came from this blog Healthy Eats. Have an assortment of beverages for your guests. Mix 2 Tablespoons of butter, 2 cloves minced garlic and 1 teaspoon of Old Bay seasoning. Spoon this mixture on each foil packet. Pinch foil together at top, and place on hot grill. Cook until done, usually between 15-20 minutes. Garnish with lemon wedges and parsley. And for the meat lovers, how about London Broil on the grill. Marinate for at least four hours in a soy-garlic mixture to tenderize it. Sear the London Broil on your hot grill, then move to indirect heat to finish cooking it to your liking. We started with Peach-Laquered Chicken Wings, a recipe I found on Carol's blog Carol at No Thyme To Cook. In the summer, you might like to skip the baking and make a quick and easy dessert. We used Klondike ice cream sandwiches, the ones that are 100 calories and have scalloped edges. Serve with a small gravy boat of your favorite warm sauce such as raspberry or black cherry, and garnish with chocolate shellfish (a Tuesday Morning clearance item). Another idea - if you are serving youngsters, roll the edges of the ice cream sandwiches in colorful sprinkles. 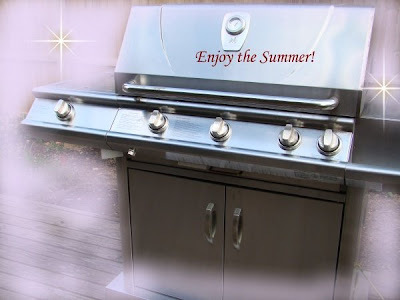 Wishing everyone a summer filled with sunshine and great grilling! Your version of that Ginger Iced Tea recipe looks delicious! (Love the glasses especially!) Thanks for the shout out to HealthyEats.com, too. We have a clam bake every August and invite all the neighbors. We get a couple of dozen people. It's a wonderful way to get to know the neighbors. Yayyy Mr. Linky worked :-) Your post is just gorgeous Debbie! So many fun things you prepared. The lobster looks phenomenal. I just got an idea as I was looking through your post. Gotta work on mine tomorrow! Hope you have a great weekend and thanks for being such a great host. It would be so much fun to really come over for a BBQ at your house! What a delightful post, Debbie! I love your seafood theme and tablesetting. What a great idea to do the lobster/clam bake on the grill rather than in a pot or pit. The ginger iced tea and the Klondike bar dessert sound wonderfully refreshing and simple for summer. Thank you for hosting such a fun event! Debbie, this is a fantastic kick off for summer. You always do it up right and this time is no different. I'd be there with Suzy in a heartbeat... you are definitely the hostess with the mostest! Love your tablesetting. Hi Debbie - your clambake is just beautiful and your dining partner is too! I'm soooooooooo hungry now, even though its early in the morning! Debbie - Everything looks scrumptious!! You could invite me over for this ANYTIME!! Love the shell fish dishes..
Debbie, what a wonderful kick off to summer! Your intimate table setting and decor are fun and I love the "sea" theme. The white seashell dishes are gorgeous with the green plates. What a neat idea to do a clambake on the grill. I have never had a clambake (not too many of those in MN) - but it sure does look good and I would be there with Suzy and Jayne in a heartbeat too. How fun to make such a beautiful dessert out of a klondike bar - this will definitely be a must try. The dessert photo with the D & J mugs, sparkling stars and peonies just "speaks" romance - and a wonderful end to a romantic dinner to me ;) All of your photos really set the mood of the BBQ and make us feel like we were really there (though with all this romance J is probably glad we weren't). Loved everything about this post - Thank you for hosting such a fun event! I love your clambake! The lobsters, everything, but I sure do wish I could have those steamers! Excellent kick off to summer! You're a great hostess, Debbie! You and Joe always throw such great parties! I'll be joining in a little later! Your grilled seafood looks wonderful. I know I am a little late signing up for this...I just discovered it, maybe next week I will be ready. Looks delicious! 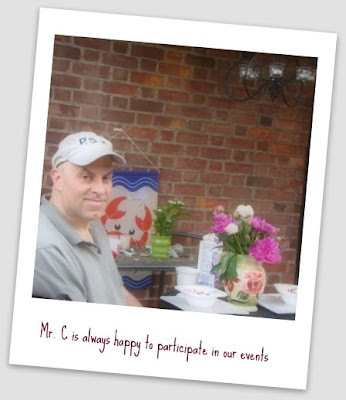 Just linked to your post from the MyPunchbowl party planning and online invitations blog where I wrote about hosting a clambake. I must have missed this one!! Seeing all the names.. memories! Yes many memories! Blogging is like a diary for me. I can’t believe all I have pushed myself to do over the last 10 years of blogging. So glad I did! Debbie, this sounds perfect for a hot summer evening, and I love the idea of that tasty, low cal dessert. Glad you shared this one again. I like pulling favorites out of the archives, and you've inspired me to do the same. Thanks, my friend!